After last week’s nutella cinnamon rolls, I think it’s full speed ahead on fall projects and while these DIY potholders will totally work for any time of year in the kitchen, there’s something about crochet that makes me think of the fall and winter months. 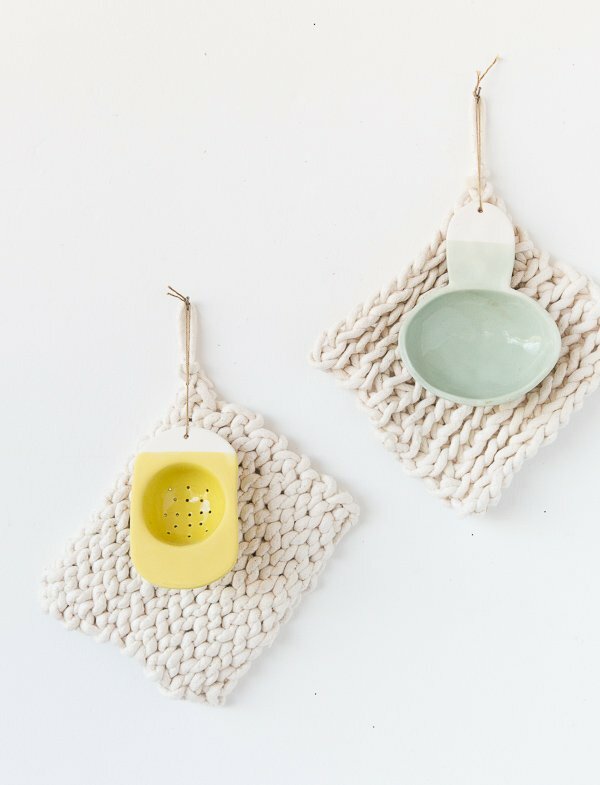 The best part about these DIY potholders though is that it only requires ONE material and so special tools required (unless you count scissors as a special tool) because these were finger crocheted. Anyone as excited as I am?! Click through for the tutorial. Start with a slipknot. Then pull the long side of your cotton piping through the hole you created with the slipknot, forming a loop about the same size as the first hole. As shown in photo. Continue this process until you’ve reached roughly 8 inches in length. Then, you’ll start creating additional rows to thicken the width. To do that, thread the cotton piping through the second to last loop and then the last loop. Repeat this process (where you’re threading through two holes each time) until you’ve reached the end again. Once you reach the end, make a loop only going through the last loop. This will give you the start for the next row. Then continue by creating loops through the previous holes to create more rows this same way until it’s roughly the size of a potholder – about 8 inches wide by 8 inches high. Once you’ve reached the desired size, pull the piping all of the way through the final loop and pull tight. Now, it’s time to add a loop for hanging and then you’re done. To add the loop, take the extra piping and feed it through the closest loop hole until you have a loop that is about 1 inch in diameter. Wrap piping around the base of the loop and create a knot to secure it. Finish it off, by cutting off the excess piping as close to the base of the hanging loop. 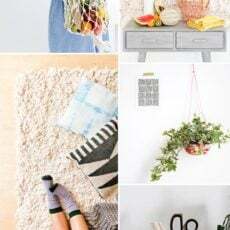 Click the image above for a zoomed in view of the step by step photos. And that’s the potholder project. The cotton piping is pretty thick, so these little guys will really help protect surfaces from heat, etc. ALSO, they can be dyed or painted, if you’re looking for something with a bit more color or want to take this project a step further. 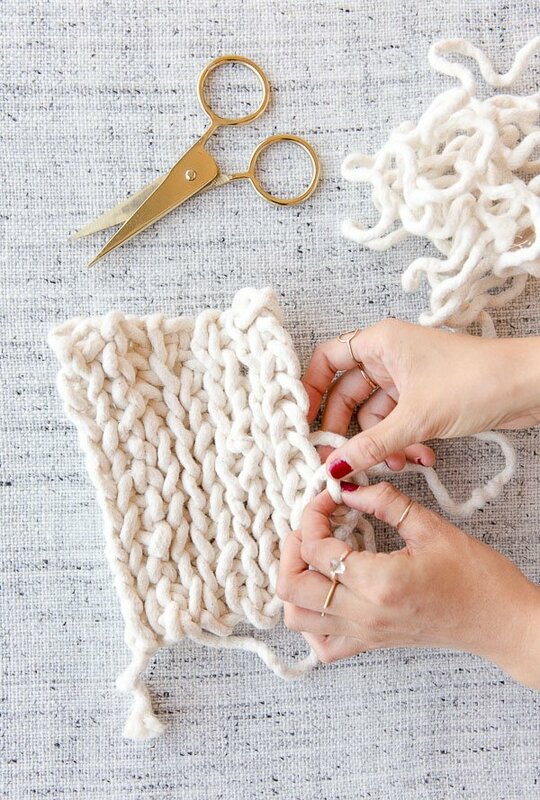 Have you ever tried hand crochet before? 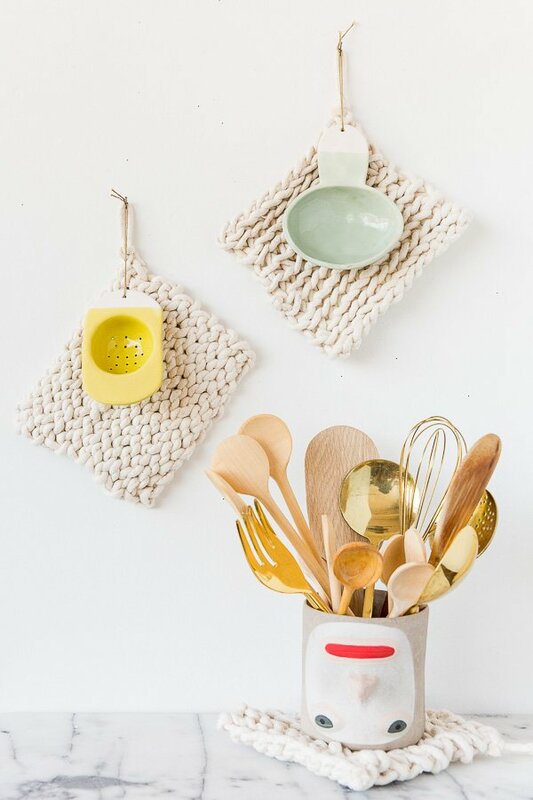 Think you’ll try the DIY potholders for your kitchen? I love how easy this is, and I really like the texture! Thanks Michelle. 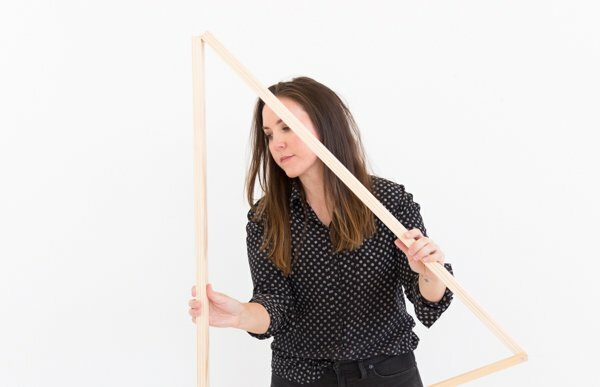 Such an easy project to try! I love that creation! I love the way it turned out. Lovely idea, thanks for sharing. 2 tips for adding colour. Use embroidery silk, just pull out a length and hold it against the cotton piping. Want bling? Then use some of the gorgeous metallic sewing thread on the market just as you did with the embroidery thread or combine both with the cotton piping. As well as pot holders these make great personalised belts. Thanks for the suggestions Lucy. 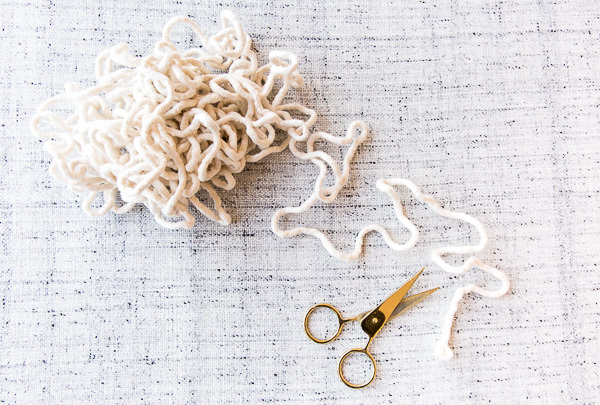 I love the idea of wrapping embroidery floss around sections of piping before crocheting it to add color. These are so cute! 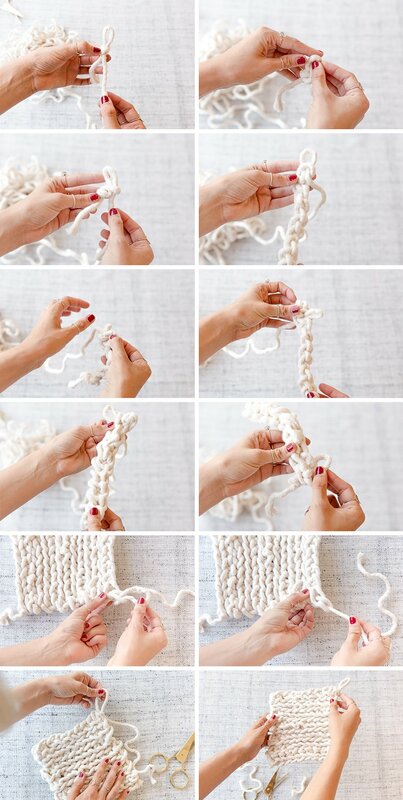 I’ve always wanted to learn how to hand knit. Maybe today is the THE day than Sophie?! 🙂 It’s so easy! These seam to be heavier than regular yarn. I have made reg yarn pot holders and always got burned. I may just try the cotton piping. Yep, they are thicker / heavier than yarn Katie. Let me know if you give it a try! It really looks easy but I hope I will be able to create something nice. The idea of hand knit really amazed me. Is this piping available someplace like Michael’s, do you think? Would love to be able to pick it up today. Great post. In store. I’ve bought some there before. 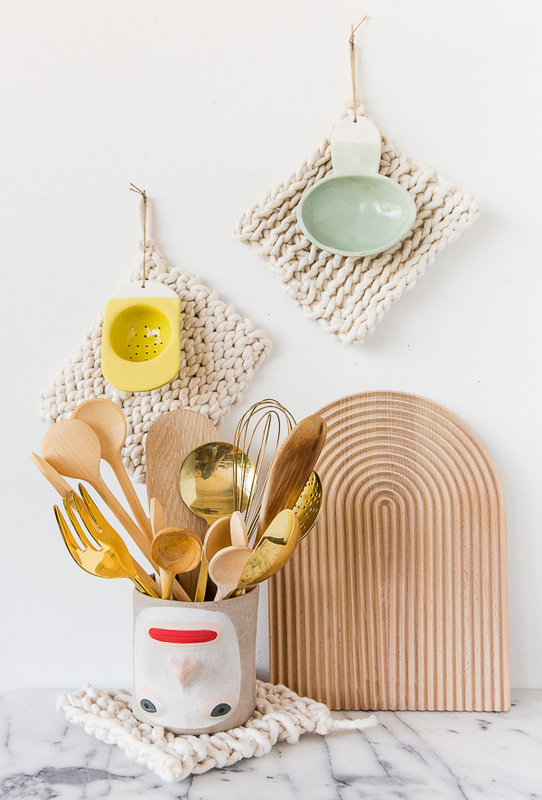 Is that a cutting board in the photo next to your beautiful potholders? I’ve seen it in another magazine and think it’s wonderful! Where did you find it? 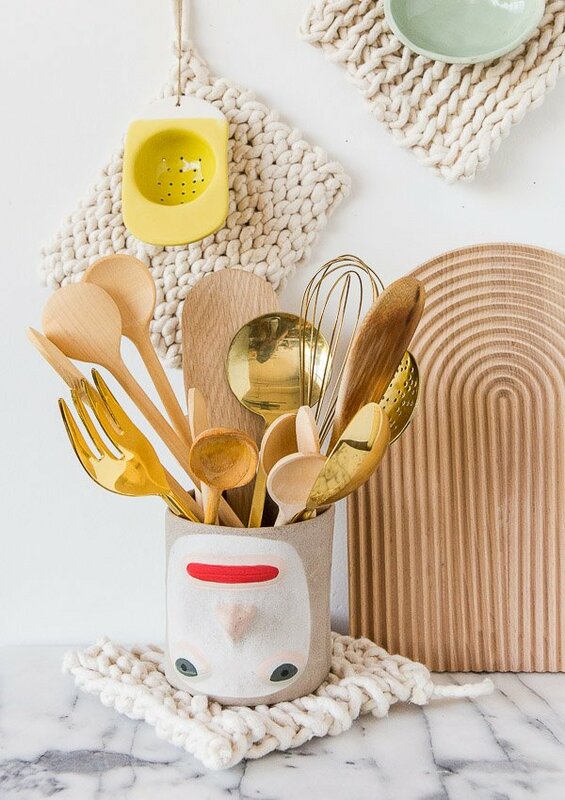 I read this blog about the potholders because I loved the utensil holder. Did you make it or buy it? I have a daughter who loves “head” and “hand” creations. She go crazy for this Head! https://group-partner.com/collections/all/products/rory They have a bunch of other face options too, if you click on the ‘all pots’ section. 🙂 Happy shopping.